The University of Maine has launched a new National Science Foundationsponsored Integrative Graduate Education and Research Traineeship (IGERT) – the first of its kind to focus explicitly on adaptation to abrupt climate change (A2C2). The A2C2 IGERT is a partnership between theClimate Change Institute (CCI) and the School of Policy and International Affairs (SPIA) and is focused on the need to adapt environmental policies and management strategies to meet the social and ecological challenges caused by abrupt climate change events. The program is funded by a five-year, $3 million award from the National Science Foundation, and will support the research of 24 Ph.D. students in Earth sciences, ecology, economics, anthropology and archaeology. Their research will focus on the effects of abrupt climate change on global security, ecosystem sustainability, and the integrity of economic, social, political and ideological systems. (Review the symposium agenda, or download a PDF Summary of this post). The 2012 ACUPCC Southeast Regional Symposium took place at Agnes Scott College, November 7-8th, 2012. ACUPCC Regional Symposiums are working sessions to foster dialogue and collaboration among ACUPCC signatories who are facing similar challenges and opportunities in their geographic regions. The conference garnered participation from 45 colleges and universities, representing states throughout the Southeast, achieving cross-institutional dialogue, knowledge exchange, and the creation of new solutions to Climate Action planning, curriculum reform, and other key issues. This conference marked the third regional symposium hosted by the American College & University Presidents’ Climate Commitment. Georgia Tech is committed to the development of a sustainable campus community, creating distinctive architecture and open spaces. In keeping with this goal, Georgia Tech has a clear mission for its new Carbon Neutral Energy Solutions Laboratory Building: carbon neutral net zero site energy use. The 40,000 square foot facility is intended to set a new standard for sustainable design for laboratory buildings of this type by optimizing passive energy technologies, reducing electricity loads, thoughtful day-lighting strategies, water conservation and harvesting, and maximizing the use of renewable energy, including a 290kW photovoltaic array. No matter what the outcome of the presidential election, Congress will undoubtedly consider comprehensive tax reform in the New Year. Second Nature, the American College & University Presidents’ Climate Commitment (ACUPCC) and the National Association of College & University Business Officers (NACUBO) are presenting policy options for changes in tax policy and federal grant programs that would allow colleges and universities to increase operational efficiencies, reduce long-term energy expenses and ultimately contribute to administrative efforts to contain costs. 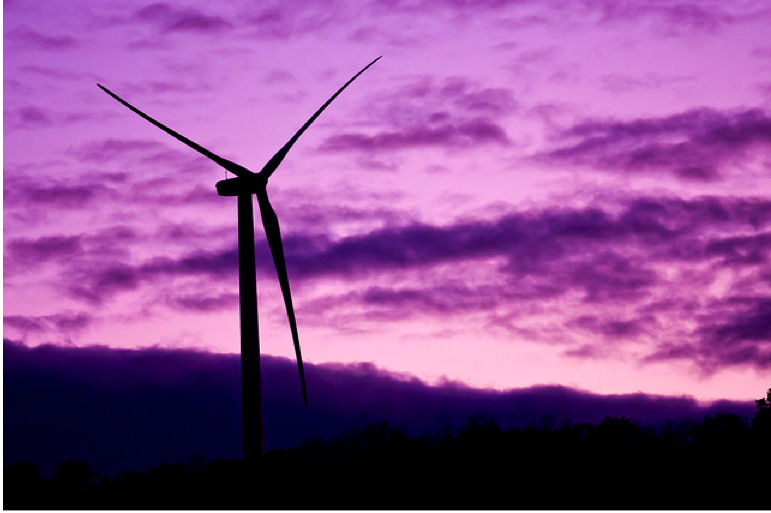 Luther College generates one-third of the electrical power it consumes with a wind generator sited on the bluff overlooking the campus and city. Lane Community College established a revolving loan fund in 2006, the only one of its kind at a community college, to pay for energy conservation and renewable energy projects through utility carryover. The fund, called theEnergy Carryover Fund, realizes savings when current year electricity and natural gas expenditures are less than current year budget. Additionally, rebates and other incentives for energy-focused projects can be deposited into the Fund, helping to finance more projects in the future. The Fund is managed and implemented by Lane’s full time Energy Analyst, Anna Scott, and currently stands at $122,000. Annual budgets for electricity and natural gas are determined using an energy use index calculation for the baseline year of 2004-05 and the current year’s prices. Money is transferred to the Carryover Fund if Lane is purchasing less energy per square foot because of efficiency, conservation, and on-site renewables than in the baseline year. 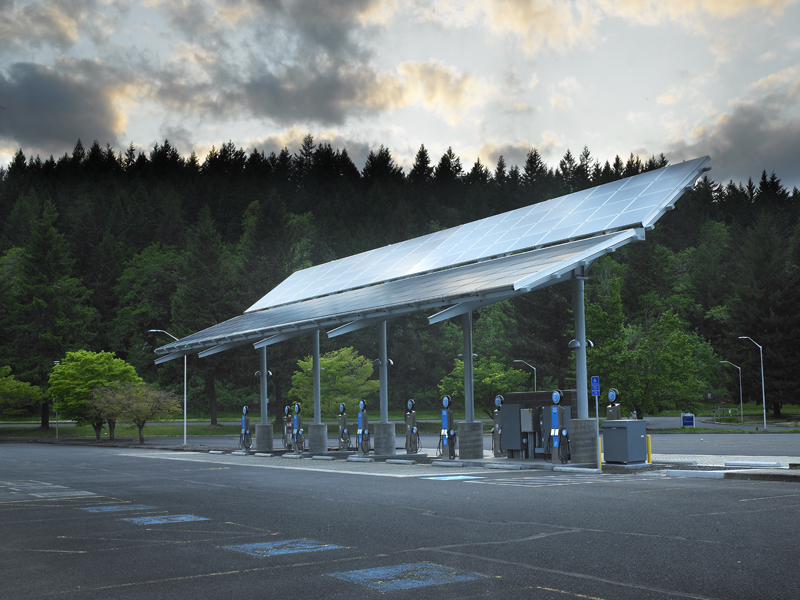 Lane’s Solar Station provides electricity for charging vehicles and power for nearby buildings. How significant a role can campus-based renewable energy play in the University of Vermont’s (UVM) progress towards carbon neutrality? Back in 2011 this question spurred the University of Vermont’s Clean Energy Fund to award up to $100,000 toward a Comprehensive Campus Renewable Energy Feasibility Study (CCREFS). The intent of the study was to generate scenarios to aid in renewable energy planning at UVM by getting a broad view of the potential for these technologies on-campus. The outcome of this study will also help to inform meeting UVM’s Climate Action Plan first target of becoming carbon neutral with our purchased electricity by 2015. The funding for the CCREFS project was primarily sourced from UVM’s Clean Energy Fund (CEF), a student green fund approved in 2008 by UVM’s Board of Trustees. The CEF is sustained by a self-imposed student fee of $10 per student per semester and generates an estimated $225,000 per year. The fund was created in response to students’ desire to have UVM advance renewable energy research, education, and infrastructure on campus. To date, the CEF has awarded funding to twenty projects including the development of an internship program, CEF graduate fellowship, and lecture/workshop series. Join Second Nature and the EPA Green Power Partnership for "The State of Renewables in Higher Education"
Second Nature and the U.S. EPA’s Green Power Partnership are collaborating to identify the barriers to expanding renewable energy use among colleges and universities, identify solutions, provide education and training on green power procurement strategies and explore the possibilities of joint purchasing opportunities. To kick-off this partnership, Second Nature and EPA invite you to participate in an interactive event to learn more about trends and possibilities in colleges and universities incorporation of green power onto their campuses, and in their climate reduction goals. The live event will stream on this page. Please bookmark this link and register to participate in the event. Read more about Join Second Nature and the EPA Green Power Partnership for "The State of Renewables in Higher Education"
The Campus Sustainability Day 2012 Keynote Broadcast, Preparing Students for a Changing Climate, aired live on Wednesday October 24th, 2012. Click on the video above to watch the broadcast. Read below for more information about the program and events held for Campus Sustainability Day in 2012, and visit the 2012 CSD Second Nature website. Join us in celebrating the 10th anniversary of Campus Sustainability Day with a live panel discussing the role colleges and universities must play in creating sustainability education for all students which prepares the next generation of leaders to lead a just, healthy, and sustainable society. How can colleges and universities prepare students for a changing climate, society, and economy through sustainability education? I’ve spent many years making the case that transitioning to a greener, more advanced energy economy will create jobs, spur economic growth and put America on a path toward global technological leadership. But lately, I’ve been thinking that I’ve placed too much emphasis on the stuff side of this equation—the need for investment in the products that make up the greener economy, like the wind farms, smart grid systems and efficient cars—and not enough on the people side—the high-quality workforce that can actually dream up, make, and install all that stuff. What does America need provided in advanced education, experience, and skills in order to prepare a workforce of students to meet the needs of the new green economy? Student involvement, ideas, and innovation have been and continue to be a driving force behind sustainability successes on college and university campuses. In 2008, Focus the Nation (FTN) launched a national teach-in campaign to empower students through education, civic engagement, and action to advance a clean energy future. In turn, the ACUPCC has provided a terrific opportunity for students through their FTN training to play an integral role in the development and implementation of their campus’ Climate Action Plan’s. Currently FTN offers the Forums-to-Action (F2A) program providing students withleadership skills, energy literacy, experiential learning and professional development. The F2A program benefits both the student and campus as it provides a framework for interdisciplinary collaboration, academic engagement with industry experts and elected officials, and an opportunity to apply existing campus resources to urgent sustainability issues in the community, to name a few. F2A participants at the University of Utah and the University of Tennessee, Knoxville have already made an impact. Their efforts show how valuable student leadership in implementing the climate action plan can be to the institution’s carbon footprint, and the capacity of students to prepare for a changing economy by shaping their institution’s climate and sustainability initiatives. The celebration of the 10th Anniversary of Campus Sustainability Day (CSD) needed a topic appropriate to a moment in time when campuses have shown that the impossible is possible – changing the way they teach, operate, build, and plan in order to reduce emissions and prepare students to lead a just and sustainable future – while recognizing the challenges and opportunities still present in their journey to integrating deep sustainability education. This year, Second Nature and the CSD supporting organizations, includingAASHE, the National Wildlife Federation (NWF), The Society for College & University Planning (SCUP), USGBC, Focus the Nation, Tree Campus USA, the SEED Center, and IDEAS, are calling on campuses to participate in a national day of dialogue around a critical question which invites conversation on both success and continued roadblocks: How is higher education preparing students for a changing climate? All three institutions featured in the series so far (Luther College, University of Minnesota-Morris, and Allegheny College) are signatories of the American College & University Presidents’ Climate Commitment. Two (Luther and Allegheny) are recipients of 2012 Second Nature Climate Leadership Awards. You can watch the inspiring videos below or by following the links above. Nominations for the 2013 Second Nature Climate Leadership Awards, which recognize innovation and excellence in climate leadership at signatory institutions of the ACUPCC, are now being accepted. From a pool of 100 nominees, the American College & University Presidents’ Climate Commitment has been chosen as a top 10 finalist for the 2012 Sustainia Award. The ACUPCC was selected as the nominee in the Best Education Solution category. The Sustainia Award recognizes already existing and scalable sustainable solutions worldwide for their ability to drive positive change and generate a sustainable society. It is founded by the communications platform Sustainia and will be presented by former Governor Arnold Schwarzenegger at the award ceremony in Copenhagen on October 11th, 2012. As a finalist, the ACUPCC is also eligible to win the Community Award — a “people’s choice” award that is voted on by the public. Please take a moment to vote for the ACUPCC and spread the word. Votes are cast once per person via facebook. ACUPCC encourages signatories to go beyond these requirements and submit additional indirect emissions categories. 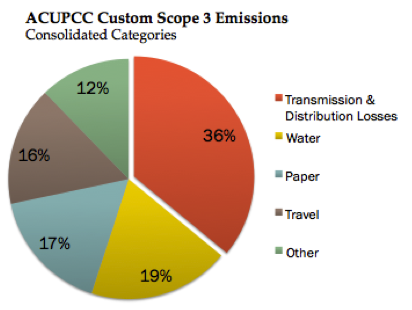 An analysis of ACUPCC GHG reports demonstrates that many signatories have chosen to report additional scope 3 emission categories. Of the 93% of the signatories that have submitted at least one GHG report, 65% have included information on their solid waste emissions and 20.6% have elected to report custom scope 3 emissions.